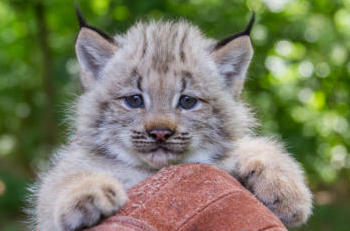 BRIDGEPORT, Conn. – June 29, 2017 – Connecticut’s Beardsley Zoo celebrated their new Canada lynx kittens born in April with a “gender announcement” on Thursday, June 29 and now it’s official: Zoo Director Gregg Dancho announced today that the two kittens are both girls. Guests joined in the fun of guessing the lynx kittens’ gender by donating at the front gate to receive a blue or pink crown, a “Team Boy” or “Team Girl” button or bracelet; or a pair of “Team Boy” or “Team Girl” sunglasses. A cake cutting and cupcake extravaganza was held in the front of the lynx exhibit, courtesy of Alina’s Cakes and Cookies in Fairfield.